We all love to have and store our memorable moments in photographs provided we can see them whenever we want. To capture photographs there are many types of different cameras by which we can capture and photograph every and each moments that we want to whether of family, friends, event and others. To make your moments more memorable with best quality of photographs there is a Sony a57 DSLR camera having 16.1 MP, Translucent Mirror Technology with clear image zoom and auto portrait framing and also with 12fps. It also comes with LCD TruBlack tilt and swivel screen and with many other incredible features. It has also listed as a best product of Sony. So never miss the moments that you think are precious for you and make your life more beautiful if you capture them because all beautiful moments are for beautiful memories and to see them in later life you need a best quality of a camera than can give you photographs as you want without causing or making any damage to images or photographs that you capture. Because it can never be in any case that what scenes or pictures you have shot you see them blurred and appear gaudy and after seeing them you become irritated and not so happy. 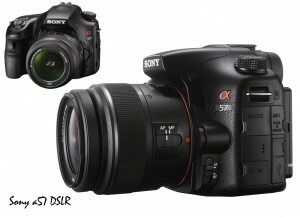 Because beautiful moments do not come back and if you really again want to enjoy them then you need to capture them and to capture them there should be a good quality of camera as Sony a57 DLSR.